The Raving Queen: Now, Here Is Something Startling!!!!!!!!!!!!!!!!!!!!!!!!!!!!!!!!!!!!!!!!!!! Now, Here Is Something Startling!!!!!!!!!!!!!!!!!!!!!!!!!!!!!!!!!!!!!!!!!!! I would hope my readers would recognize who this is, but, if not, I really cannot blame you. It is Joan Baez!!!!!!!!!!!!!!!!!!!! This morning, on You Tube, I was listening to Joan singing the old Irish ballad, "Danny Boy," a song my Irish grandmother hated with a passion. I think, because, in her view, it was about a mother sending her son off to war--and my grandmother had sent off three, including my father!!!!!!!!!!!!! I am telling you, girls, by the time Joan appeared on the musical and social scene, I think my grandmother was ready to march and protest with her. As I listened to Miss Baez, she of the Gorgeous Voice, sing this tune, there were slide projections of her from different periods of life. Of course, what changed over time was the hair style. Plenty of shots in her long, flowing locks, and in the nice short style she adapted to, so nicely. One nice one, with her hair pulled back, and a colored scarf, hanging from it. But, all of a sudden, there was this photo of Joan in a perm!!!!!!!!!!! It was so startling!!!!!!!!!! "When she do that?" I thought. I couldn't tell if she was channeling Angela Davis or Linda Ronstadt!!!!!!!!!!!!!! Only by focusing on the eyes could I be sure it was really Joan. You know it takes lots to startle me, girls!!!!!!!!! 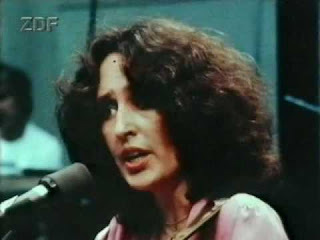 But the sight of Joan Baez with a perm, even the very idea of her getting one, is enough to do it!!!!!!!!!!!!!!!!!!!!!!!!!!!!! And I still maintain--better Joan Baez than Joan Didion!!!!!!!!!!!!!!!!!!!!! !